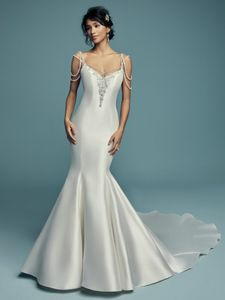 Description: Glamorous ribbons of Swarovski crystals and beading dance over the shoulders of this fit-and-flare wedding dress, completing the soft sweetheart neckline and scoop back with illusion keyhole detail. Comprised of Elodie Mikado for a vintage-inspired feel. Finished with zipper closure.